Living a Fit and Full Life: Fry Healthier with the Gourmia GAF520 Electric Air Fryer! Fry Healthier with the Gourmia GAF520 Electric Air Fryer! These simple words describe the Gourmia company mission. All of the company’s products are designed for cooks who want to make easy, healthy and delicious meals every week, not only on special occasions and holidays. Gourmia’s products deliver a higher standard of innovation, performance, and value. They bring professional-chef techniques to every home kitchen, making healthy gourmet meals easier to achieve. Headquartered in Brooklyn, NY, Gourmia is passionate about cooking and the tools for the healthy lifestyle. With decades of small appliance expertise, Gourmia’s founders know what cooks are looking for: dependable, easy to use tools that will make their lives easier. Gourmia enables consumers to eat better, fresher, and healthier without spending hours in the kitchen prepping, cooking and then cleaning up. From sous vide immersion cookers to multi-purpose cookers and juicers; the team at Gourmia has taken input from numerous chefs and consumers to make their products the best in their category. Make fries, seafood, poultry and meat with the touch of a button, or set your own custom time and temperature. Easy read, clear, LED display. Now you can fry foods without the dangers of hot oil. This air fryer will fry, bake, roast and grill your food in a flash thanks to state of the art technology. Cook like a pro! The adjustable temperature controls allow you to select the perfect heat and settings for perfect results every time. 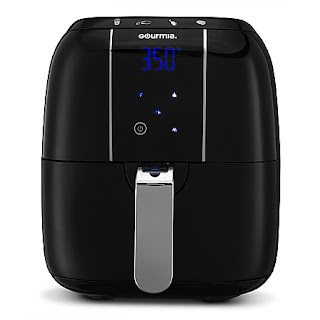 Fry healthier with the Gourmia GAF520 Electric Air Fryer! I'm a huge fan of fried foods but eat them in moderation because I know how unhealthy fried foods are. My first time trying out the Gourmia GAF520 Electric Air Fryer I air fried some wings and oh my word, they were delicious. They tasted just like fried wings and even my husband loved them. I was completely blown away at how amazing they tasted and that they tasted just like fried wings because no oil was used to cook them. I also made some french fries from scratch in the Gourmia GAF520 Electric Air Fryer that were out of this world delicious. Normally, I make my french fries in the oven but they always end up sticking to the pan and lose most of the seasoning. With the Gourmia GAF520 Electric Air Fryer the seasoning stayed on and I didn't have to heat up the house by using the oven. 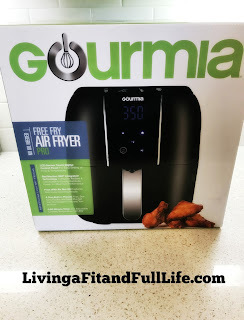 The Gourmia GAF520 Electric Air Fryer is absolutely amazing and should be in every kitchen because it makes the best guilt free air fried foods! Click HERE to find a store near you that sells Gourmia products! Click HERE to learn more about Gourmia! Follow Gourmia on social media!